in Carbon and Our Soil, Education, News At A Glance and tagged compost, industrial compost. Bookmark the permalink. 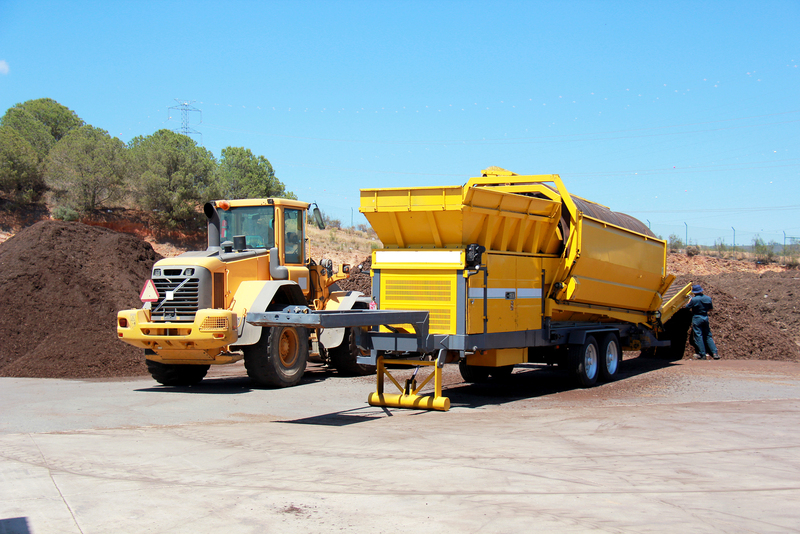 Though primarily identified as a distributor of heavy construction equipment, McClung-Logan dedicates a good portion of our inventory to Environmental Machinery for the process of industrial composting — the treatment of large volumes of organic waste and transforming it into compost. There are four types of Environmental Machinery: Shredding, Screening, Separation, Composting, and Recycling. Komptech manufactures most of these machines and is the leading innovator in the mechanical and biological processing of solid waste and biomass. Bandit Industries is a leading manufacturer in horizontal grinders and recyclers. Let’s get an overview of what each of these machines are and how they are better for the environment than other types of machinery that are regularly used on work sites. ShreddingShredding is the first step in essentially all processes of waste treatment. It helps separate waste for recycling and reduces materials to a uniform particle size for further treatment.By offering a wide variety of shredding machines, our equipment is ideal for standardizing particle size and separating foreign material. See a complete list of our shredding inventory. ScreeningScreening sorts waste by particle size, ensuring a smooth process flow. It guarantees quality material at the end of the composting process.The vast variety of screening machines we provide are all designed with the highest quality materials and components. View our inventory of screening equipment. SeparationSeparating machines divide the waste stream into different fractions: metallic, heavy, light, etc. This makes for efficient recycling and reclamation—the process of getting something useful from waste.Our separator machines boast long service life and low operating costs, flexible for a wide range of applications. View our selection of separation equipment. CompostingComposting machines turn large volumes of organic waste into valuable compost. Turning trash into valuable raw materials, these machines can process an array of waste challenges: green waste, untreated waste wood/root stocks, treated waste wood, biowaste sewage sludge, household waste/residual waste, bulky waste/commercial waste, production waste (such as tires), and packaging waste (such as paper).Composting machines that are designed for the most demanding applications and heavy-weight materials can be found here at McClung-Logan. Click here for a full list of our Komptech composting inventory. RecyclingHorizontal grinders are used to process large volumes of municipal waste such as storm debris or yard waste into saleable products. These machines are available in a variety of configurations to use with different scopes of land-clearing projects and operations. They use horizontal feed systems and less-exposed grinding mechanisms. These features make horizontal grinders a safer option to utilize in populated areas because they don’t allow material to escape as easily out of the machine.Our horizontal grinders are designed for rough-terrain land-clearing operations, and are built to endure. View our full list of Bandit Beast Grinders here. What are the benefits of industrial composting?